Place meat in a large mixing bowl and create a well in the center of the meat. Fill the well with the bread cubes and dampen them with a splash of milk. Pour 1 beaten egg over bread and add seasoning or salt and pepper, allspice, tomato paste and onion to the bowl. Combine the meat, bread and grill seasoning or salt and pepper and form mixture into 4 large oval patties 3/4-inch thick. Pan fry meatloaf patties in a nonstick skillet over medium high heat 7 minutes on each side under a loose tin foil tent. The tent will reflect heat and allow the steam to escape the pan. Cover the quartered, red-skinned potatoes in water in a medium saucepan. Bring water to a boil and cook potatoes 10 minutes or until fork tender. Turn heat under pan off; drain potatoes and return to hot pan and warm stovetop to dry potatoes out. Add butter, sour cream, scallions, and milk to potatoes and smash to your desired consistency. Season potatoes with salt, to taste. 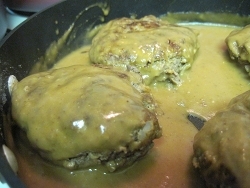 Remove meat loaf patties to a platter and return pan to heat. Reduce heat to medium and add butter and onion to your skillet. Cook the onion 2 minutes and sprinkle pan with flour. Cook flour 1 minute and whisk in 1 cup beef stock. Bring broth to a bubble. If gravy is too thick, thin with additional stock. Stir in condiments and remove gravy from heat. Stacy's Notes - have made this several times; we really like it. I use 1 pound of ground round (rinsed and drained of fat). Also use ketchup instead of tomato paste, use 1 slice whole wheat bread spread with fat free butter, and use one can beef stock (or broth made from beef bouillon granules).